Helsinki_1989_September_15_009, originally uploaded by Brin d’Acier. When I moved back to Finland after ten years abroad, I found myself a stranger in my own country. I started exploring it, keeping a travel journal. 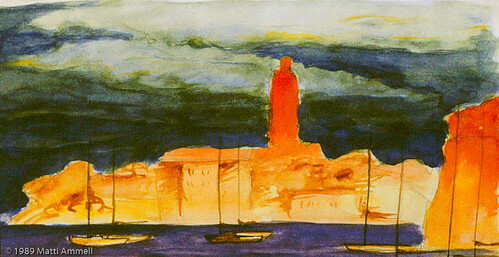 I recorded the changes in light and weather, studied once familiar landmarks that had become exotic. 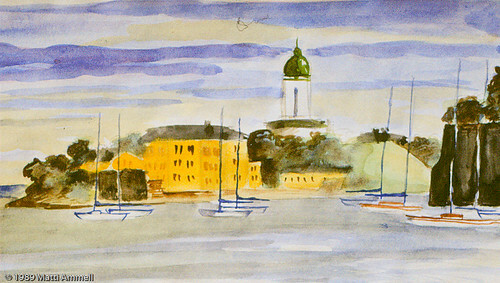 These watercolour sketches were done from the seaside at the southernmost tip of Helsinki, and show the 18th century fortress island of Suomenlinna, often called Gibraltar of the North. It is a just a ferry ride away from downtown, but in many ways remains a small village. In the summer it is overrun by tourists and picnickers, but when the last ferry has left, it returns to a slower rhythm. I lived on the island as a child, and came to school by ferry. In the winter, when the sea froze, I walked to school over the ice. Yes, it was safe, they even ran a road for cars over the sea, and there was a wooden sidewalk running alongside it. Helsinki_1989_September_15_010, originally uploaded by Brin d’Acier. Helsinki_1989_September_15_011, originally uploaded by Brin d’Acier. Helsinki_1989_September_15_012, originally uploaded by Brin d’Acier. Sketchbook_Helsinki_1990_020, originally uploaded by Brin d’Acier. Sketchbook_Helsinki_1990_021, originally uploaded by Brin d’Acier. 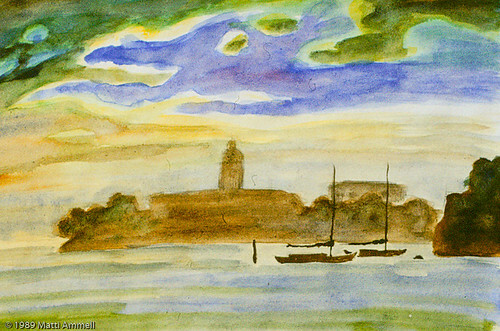 This entry was posted in Sketchbook and tagged finland, helsinki, landscape, sky, watercolour. Bookmark the permalink.